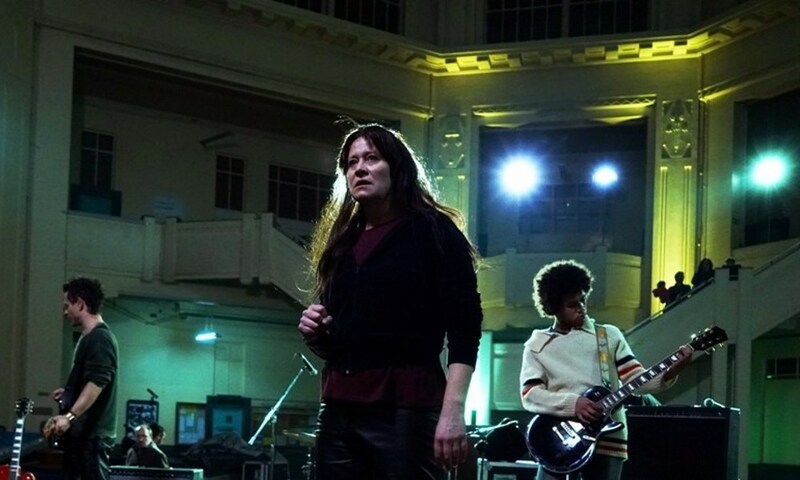 Opening the Horizons sidebar, Susanna Nicchiarelli’s Nico, 1988 is a biopic of the German songstress who found fame with The Velvet Underground. Danish singer and actress Trine Dyrholm plays the diva with verve and energy, in a portrait which is also something of a reevaluation. “Don’t call me Nico,” Christa Päffgen (Dyrholm) tells her manager Richard (John Gordon Sinclair). “Call me by my real name.” Nicchiarelli’s biopic sets out to do that, telling the story of ‘Nico after Nico’ as the director herself states. The year is 1987 and the singer has settled in Manchester of all places – it reminds her of Berlin after it had been bombed, she tells a local radio DJ, unflatteringly. Richard is a gopher, a club owner and a fan, determined to see that Nico’s music and voice find their audience. He organises a European tour, taking her with a back up band to Paris and Italy. Here she meets a kindred soul in guitarist Dominico (Thomas Trabacchi) who is one of the few people to accept and appreciate her for who she is now. Everyone else seems intent on treating her as a historical artifact, especially one whose value has more to do with who she has slept with than the music she has made and is still making. “Didn’t she sleep with one of the Rolling Stones? Which one was it? The one that drowned?” says a promoter. Unfortunately, this kind of gauche obviousness is re-enacted at times by Nicchiarelli’s script which too often has a character simply verbalise its point rather than letting the audience discovery via other means. And, incidentally, how does a rock fan and music promoter in the 1980s not know the name, Brian Jones? Another more emotionally disturbing element of Nico’s legacy is the fate of her son Ari. The film is coy about the paternity – Alain Delon always denied he was the father – but again a famous man has put his imprimatur on Nico’s life. Ari is in a hospital recovering from an overdose and has problems with depression. Richard is instrumental in delivering her son back into Nico’s life even as he organises a trip behind the Iron Curtain for an illicit concert. This leads to the most powerful scene of the film when, unable to get heroin, a distraught Nico goes cold turkey and doesn’t even want to perform by the crowd that have gathered risking arrest. The energy and appreciation of the audience bring her back to life and her performance of My Heart is Empty is a cathartic moment of pure rock n’ roll. The musical performances lace the film with some stand out moments. Max Viale and his group Gatto Ciliegia Contro il Grande Freddo reimagine many of Nico’s most famous tracks and will have many reassessing the singer who most know through the three songs she sings on The Velvet Underground & Nico. Cajoled into singing in exchange for free rooms by the jazz pianist/manager, Nico gives an on-edge version of Nature Boy. It’s in these moments that Dyrholm and the film feel at home. The heroin and the monstrous Diva stuff feels more routine by comparison and subplots concerning other band members meander into dead ends. Gordon Sinclair is a superb foil, braving a fine Mancunian accent. But this is Dyrholm’s film and her commitment to the role is obvious. Her Nico is a flawed survivor, troubled and scarred but still there, persisting in her art: a worker in the tower of song.